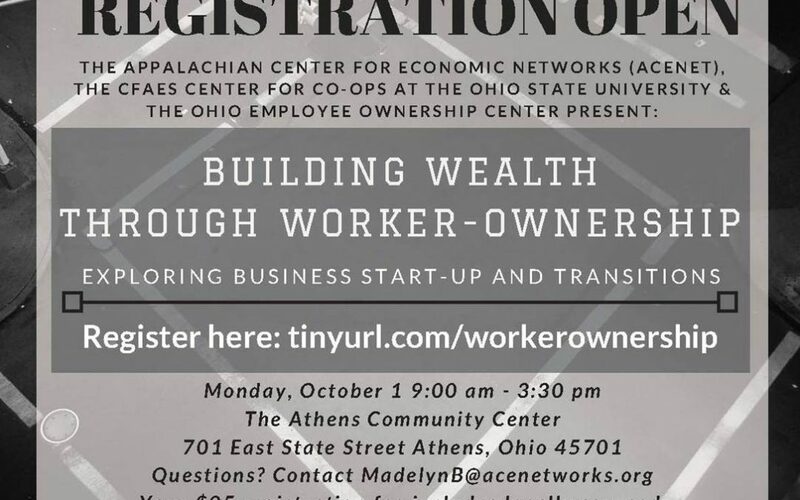 Gail Patton and Ursulette Huntley attended a workshop in Athens, Ohio on October 1; “Building Wealth Through Worker Ownership”. During the day they were able to hear about some exciting projects around our region. Representatives from the Cincinnati Union Co-op Initiative and The Greater Dayton Union Co-op Initiative talked about their work and their progress toward opening retail grocery stores as worker-owned cooperatives using the Mondragon Model from Spain. They stressed the dual purpose of the Co-ops: provide good jobs with benefits AND fill a need in the community. A grocery store can provide good jobs, but unless it is located in a place that doesn’t have access to fresh food it does not serve a particular need in the community. Conversely, a grocery store could serve a community need, but if it doesn’t provide good jobs with benefits, it doesn’t meet the criteria. We plan to visit Cincinnati and Dayton sometime soon to learn more about these projects. The organizers did a great job of presenting information about worker-owned cooperatives by involving people who are actually developing cooperatives. Check out the websites of these pioneers to find out more about them. If you are interested in learning more about Worker-Owned Cooperatives, please contact us through this website or by calling (304) 697-3007.